Looking for Dinosaur Party ideas that will make any birthday party or celebration stand out from the rest, while still incorporating those fascinating giant lizards? Here are two dinosaur party ideas that any party planner will really dig, no pun intended. * Costumes: Dinosaurs, Astronauts and Aliens. * Cake Theme Ideas: Dinosaurs in Space, Dino Planet or Dinosaurs Landing on the Moon. * Decoration Options: Hanging Pterodactyls, Dinosaur Streamers, Balloons, Inflatable Dinosaurs, Inflatable Rocket Ships, Garbage Bag Asteroids and/or Creepy Alien and Hungry Dinosaur novelty items. * Grab Bag Gifts: Alien, Dinosaur and Astronaut action figures. Tropical flavored candy and Official Space Commander, Cadet and/or Captain certificates. * Game/Activity Ideas: Pin the Tail on the Brachiosaurus, Pterosaur Piñata, Aliens vs. Dinosaurs vs. Astronauts, Dino Memory Game and/or Laser Tag. * Bonus Items: Futuristic Plasma Weapon Toys, Space and/or Jungle Themed Music, Astronaut Helmets, a Large Volcano and a large Dinosaur Bouncy House. After receiving RSVP's from the dinosaur themed invitations, the next step is order an appropriate amount of space-dino cake, food and grab bag gifts. Then it's just a matter of setting everything up for the day of the party. Optionally, this same theme idea can be used to host a Prehistoric Alien Encounters party, where the theme plot is subtly flipped around so that the aliens come to visit the dinosaurs. * Craft Supplies: Size Small Cotton T-Shirts, 3-5 Colors of Dye or Food Coloring, 3 Large Heat Resistant Containers, 3 Large Wooden Spoons, a Box of Large Rubber Bands and Newspaper. * Food Options: Stir Fried Dinosaur Surprise - Any mixture of stir fry that includes sweet bell peppers, white rice and beef/chicken. * Costume Ideas: T-Rex Foam Hats and Dinosaur Masks. * Decoration Options: Dinosaur Cups, Dinosaur Foil Balloons, Multicolored Streamers, Tie Dyed Wall Sheets and Dinosaur Cupcake Baking Cups. * Grab Bag Gifts: Dinosaur Temporary Tattoos, Dinosaur Sunglasses and Dinosaur Wall Stickers. * Activity Ideas: Tie Dying Tee Shirts, Dinosaur Checkers and Orange Races. 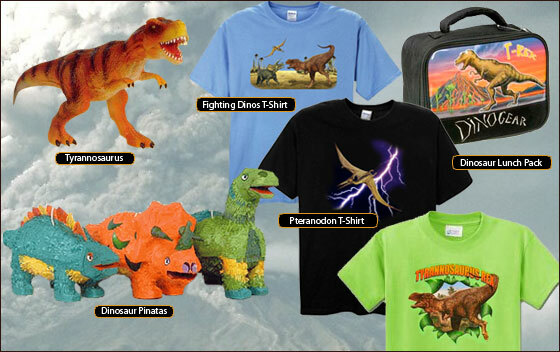 * Bonus Items: Inflatable Dinosaurs and/or a T-Rex Wall Mount Replica. Caution: Food Coloring is washable, true dye is challenging to remove from skin and clothing. Dinosaur theme is a brilliant one for kids and teenage parties. My cousin has organized an exhibition of his paintings at one of the standardized San Francisco event venues next week. He has made awesome arrangements to impress his clients.